Nationalist Right Lega Becomes Italy’s Most Popular Party!!! There’s some awesome news coming out of Italy on the heels of the election in Sweden. 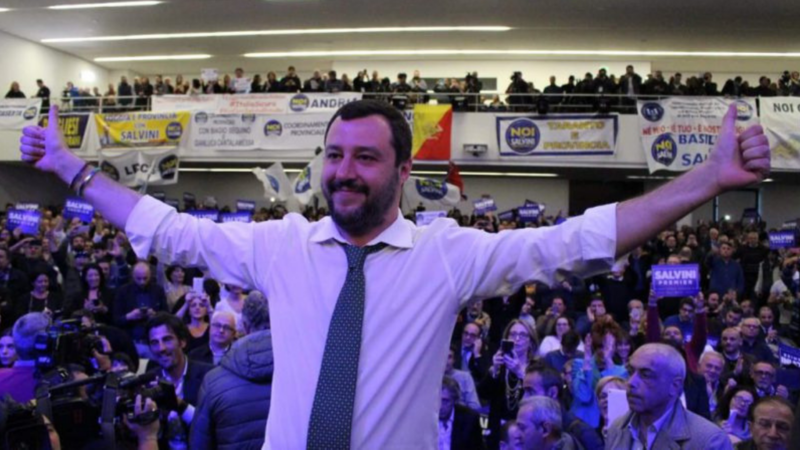 Matteo Salvini’s nationalist right party Lega is now the number one most popular party in Italy. According to the ‘Poll of Polls’ website (https://pollofpolls.eu/IT) which is an aggregate of total polling more than 200 polls done since 2006, the nationalist right party The League or Lega, formerly known as Northern League, is polling at around 32 percent among the eight political parties represented in Italy. Up until now, another populist party, the Five Star Movement, has been polling at the top, consistently at around 30 percent of the vote. These two parties, Five Star and the League formed a populist nationalist coalition that has the governing majority in the Italian parliament. But now, with this aggregate, we see that The League has officially surpassed Five Star to become the single most popular party in Italy. This topping of the polls for Salvini’s Lega party is to be expected. Remember that back on the March 4th national election, the League got 17 percent of the vote as part of an overall center-right coalition that received a total of 37 percent of the vote. What we found happening was that because the League got a higher percentage of the vote than did its coalition partner, the more ‘mainstream’ or center-right Forza Italia, supporters began to move from Forza Italia to the League. Since then, the League has been going up and up and up, to nearly doubling their support. We have been seeing this in the polls coming out since June. On top of that, back in June if I recall, The League completely dominated the mayoral elections held throughout the nation. There is really no way of exaggerating just how much the League is absolutely taking Italy by storm at both the federal level and the local. So what is behind it all? What is behind this surge of popularity for Matteo Salvini and The League? If you are familiar with my arguments, you can guess what three political issues are propelling The League to such popularity; border security, economic security, and cultural security. Scholars are increasingly recognizing these three issues to be the defining issues of the politics of the future. This is why we can say here on this channel with absolute confidence, A New Conservative Age is indeed rising! A new worldwide political order based on nationalism, populism, and traditionalism is in fact dominating the world stage. There is no way around that. We certainly can try to delay it. That is what all the liberal democrats are trying to do. They are doing everything they can to delay it, to stave off the inevitable, to keep their power and influence as long as they possibly can to mobilize what is left of the their fledgling majorities. But as we are seeing in nation after nation. There is nothing that they can do short of all out war (and of course I wouldn’t put that past them.) Otherwise, there is nothing they can do to stop a new conservative nationalist populist and traditionalist age rising all around us. The fundamental reason for this confidence is because of the multiple contradictions inherent in globalization, that is being so faithfully advocated by the elites in the EU and the Washington DC swamp. Globalism entails a number of dynamics that provoke significant insecurities and anxieties among global populations that globalism itself is powerless to resolve, and these anxieties are basically threefold: border insecurity, economic insecurity, and cultural insecurity Border insecurity is provoked by globalization’s transnational dynamics that encourage mass immigration on the one hand and transnational corporations that have no loyalty to land, or culture, or ethnicity on the other. Economic insecurities are provoked by what is called a global division of labor, where industrial and manufacturing jobs are relocated into third world nations while capital and finance coalesce around the financial centers of urban areas, which in turn leaves rural populations out of the loop, leaving them with mass unemployment in globalist economies. And cultural insecurities are felt by an overwhelming sense of an immigration invasion, where the cultures, customs, and traditions of a population are expected by the elites in Brussels to accommodate the immigrants rather than the other way around, as well as globalism’s narcissistic and consumer-based values replacing timeless customs and traditions. And what we have to appreciate is that Matteo Salvini and The League or Lega have built their entire political platform on resolving precisely these three very insecurities! Matteo Salvini has been not only advocating but in fact enforcing not just border security but actual and real immigration enforcement; migrants arriving at Italy’s borders have in fact been shipped back to the Middle East and Norther Africa, effectively reducing its immigration epidemic. In terms of economic security, they are working together with the populist Five Star to provide a basic universal income for all Italian citizens in need of such, along with putting forward the notion of a flat tax that would cut taxes and spur economic growth. And for cultural insecurities, Salvini has been celebrating the customary and traditional practices that comprise a unique Italian identity, along with calls for a rebirth of the Italian family and prolife culture to reverse Italy’s fertility decline. What has been the result of all of this? The result is that the nationalist populist government in Italy currently enjoys an approval rating of astonishing 68 percent according to an Ipsos poll which surveyed over a thousand Italians. Nearly 70 percent of Italians say that they approve of their government. Prime Minister Conte of the Five Star movement enjoys 69 percent approval rating followed by Salvini who had a 60 percent approval rating, and then by his coalition partner, the head of Five Star, Luigi Di Maio, at 58 percent approval. You see, THESE are the policies of the future. The policies of the future are emphatically not those of political correctness and cultural Marxism. They are not more and more corporatist globalism and more and more wars and crusades to spread western democracy around the world and in particular to the Middle East. It is not a celebration of alternative lifestyle values and feminism and the like. No, the politics of the future is nationalism, populism, and traditionalism. That is what we can expect to see more and more of in the months and years ahead. I am glad to report that Matteo Salvini’s nationalist populist Italy is helping to lead the way. Stay up to date on our latest posts. Viktor Orban Challenges Macron as Nations Begin Standing with Hungary!!! Matteo Salvini’s Vision for a United Nationalist Europe!! !